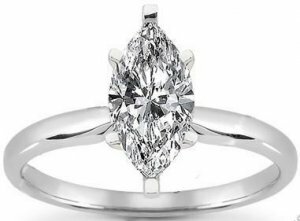 This eye catching marquise diamond solitaire engagement ring features 14K White Gold with the metal weight of 3.20 grams. Browse our diamond inventory to choose the quality and size for your center stone that would suit you the most. iBraggiotti Fine Jewelrys wedding rings are with best value and deals. Enjoy your wedding or anniversary gifts with the finest quality and style. For more options visit our pave ring and antique ring collection.